We go on weekend trips when we can. To save money we try and pack our own lunch and dinners to bring along so we have more time to just relax as a family while enjoying our weekend. This is where having insulated Lunch Bags and Totes come in play. We are able to pack meals, beverages, and snacks by person in their lunch bag and we are set to go for a day trip or even overnight trip every now and then. We don't have to worry about where we are going to eat because we have everything with us. You can find the Big Easy Brands lunch bag on Amazon. What Big Easy Brands has to say about their product. Save Money by Packing your Lunch with this Two Compartment Insulated Lunch Bag. It Features a Larger Main Compartment for items like Tupperware and Drinks, Plus a Separate Smaller Compartment above it. It Also comes with a Front Pocket as well as Pockets on Each Side, Plus an Adjustable Shoulder Strap And Carrying Handle. 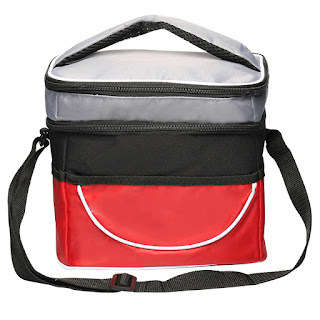 These Lunch Bags are Ideal to Take to Work, Outing Events, Picnics, The Beach, etc. Disclosure: MarksvilleandMe received one or more of the products mentioned above as part of a promotion with Tomoson and Big Easy Brands. Regardless, MarksvilleandMe only recommends products or services we use personally and believe will be good for our readers. Some of the links in the article may be “affiliate links.” This means if you click on the link and purchase the item, I will receive compensation. If you would like MarksvilleandMe to review a product or service please contact us at marksvilleandme@gmail.com.